You know, in the world of internet acronyms I’m a bit of a fail. I’m an expert LOLer, can tell my PMSL from my ROFL and do a good line in OMGWTFLOL (STFU). Beyond that though, things get complicated. Between the years of 2004 – 2008 I was in some kind of acronym void and when I emerged blinking into this new world, I remember firmly not having a clue what BFF meant. It’s not really my fault, Mr L is my best friend and he doesn’t go around refering to me as his BFF, I was handicapped from the start. Cacee is a brand I’d never heard of before seeing a selection of their polishes on a stand at Pro Beauty. 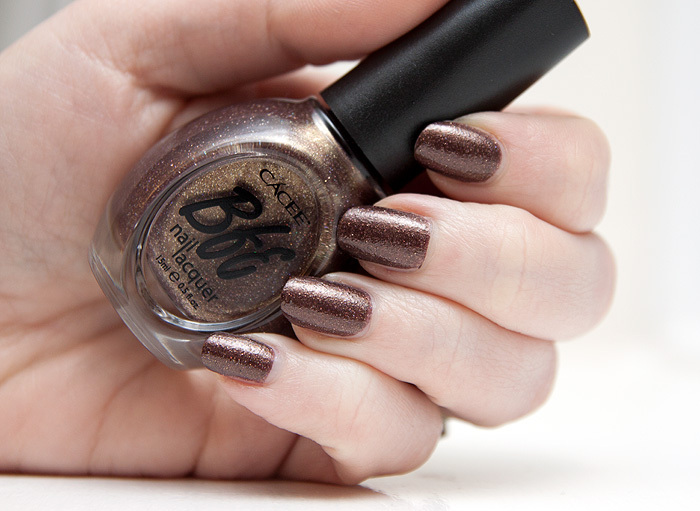 I picked up their BFF Nail Polish in Shaina for around £3.50, twirling it in my fingers and coo-ing at the scattered holo particles suspended in a pretty, chocolate brown base. Excited! It’s a two-coater and applies smoothly, sadly drying to a gritty finish – I guess those holographic particles just aren’t fine enough to sit nicely on the nail. You also lose a lot of the holo effect once on the nail, it’s not an ugly polish by all means (two coats of Lumos sorted out the gritty finish) but it just could have/should have been better you know? Have you tried any Cacee polishes? I picked up a few bottles at Pro Beauty. I like what I’ve seen so far.